It was lovely to revisit the market in Waverley station for the first time in a good while. 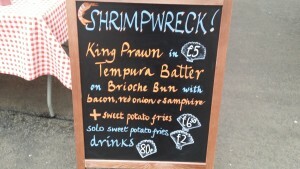 Having given the Edin-Burgers a wave, I settled upon giving new trader, Shrimpwreck, a try. Their offering was pretty simple: a king prawn tempura roll with or without sweet potato fries. I opted for both (£6.50) to give their full selection due consideration. Cooked to order by the friendly stallholder, the prawns were from Welch’s and the brioche buns were from Gorgie bakery Il Panino. The bun was toasted, dressing applied, then the prawns were added. These were then topped with bacon bits, onion and pickled samphire. With sweet potato fries added and seasoned, I was soon on my way. Taking a seat at one of the nearby tables, I tucked in. Much in the style of southern staple the Po’ Boy, this was a sandwich of distinction with each mouthful deeply satisfying. It was right up there with the Blackfriars fish burger as the finest seafood sandwich in the city. 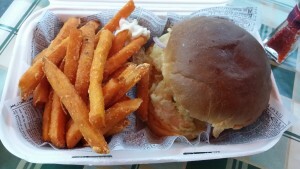 The sweet potato fries were really good, too. They were surprisingly crisp, which can be a challenge when cooking this style of thing to order in small, counter-top fryers, so this was an impressive achievement. So overall, Shrimpwreck is starting life at an outstandingly good standard. Their crisp prawn sandwich was quite magnificent and the sweet potato fries were as good as I’ve had in the city. Make sure to visit soon and visit often.